Polished stainless steel augers with companion inserts are available in 13 sizes to precisely match throughput rate. 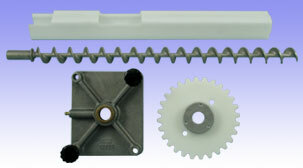 Auger assemblies come completely assembled and include auger, insert, bearing plate assembly and gear & hub assembly. Augers and inserts can be purchased separately.